Strawberry ice cream with strawberries. Made with real cream. Gluten-free. Kosher - D. Haagen-Dazs ice cream tubs. Real indulgence with just four ingredients: real cream, milk, eggs and sugar. 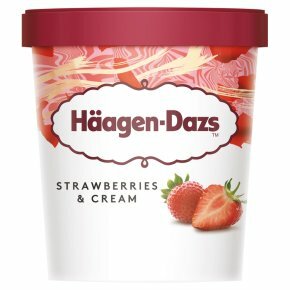 Haagen-Dazs is blended with carefully selected ingredients, to create a luxury ice cream with a unique velvety texture and unforgettable taste. Indulge in our extraordinary Haagen-Dazs Vanilla Ice Cream or treat yourself to a unique dessert with our Salted Caramel Ice Cream recipe. For the best experience, remove ice cream from freezer approximately 10 minutes before serving.